For the latter, I copied the data into Excel from the Appendix: "From Lucy to Boskop" (pp. 20-49). Over the years I have gotten many requests for this dataset. I just realized I now have a wiki so I might as well put it up. The data and Excel files, and the figures I made, are all free to reproduce, modify, and redistribute, as long as there is citation of the original paper(s) and, if relevant, my blog posts. The excel file is available if you click "Files", at the bottom of this page. I might have typed something wrong, although I was pretty careful. The dataset is now fairly out of date, there have been a lot of discoveries since 1999 or 2000, when de Miguel and Henneberg ceased data collection before the 2001 publication. I strongly request that anyone who builds on the de Miguel and Henneberg dataset make the new compilation public as well (or add to this file, and I will post an update). Published data should be accessible! 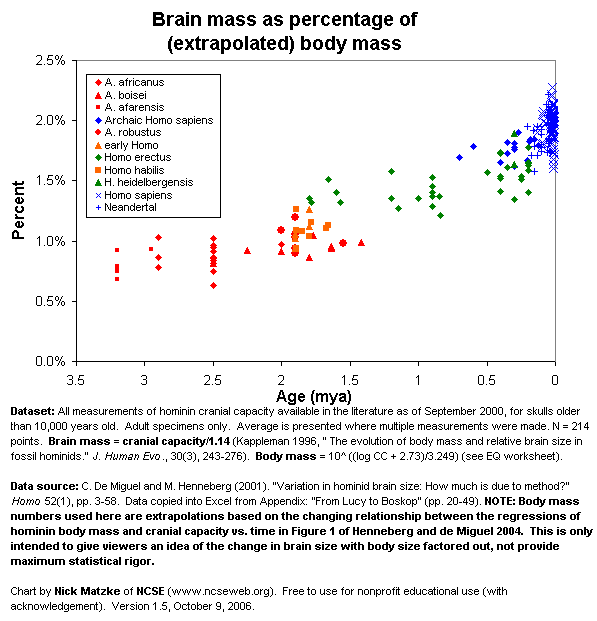 The change in body size should be taken into account when thinking about changes in brain size (see this PT post). Henneberg seems to argue for a one-diverse-species-evolving-gradually-through-time view, but this seems to be a minority view. I think at the very least the robust australopiths have to be a separate lineage (Henneberg might well agree on this point, I have not dug deeply into his view). For Homo habilis on up, I think "single diverse species evolving" or "closely-related species with hybridization as with sapiens/Neandertals" is reasonably plausible (except for floresiensis), but I'm not a paleoanthropologist. The majority view is for many species, although there is a strong critique (e.g. Tim White) that many taxa are oversplit. The species names used in the tables are just those from the source publications. There are numerous arguments about details of taxonomy — which is part of the reason I think "plot the specimen data" is better than relying on averages-by-someone's-claimed-species. 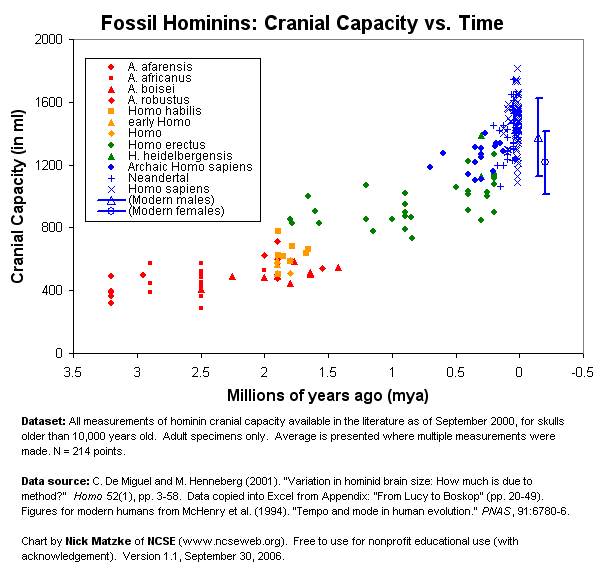 Human brain size actually gets slightly smaller over the last 20,000 years or so (http://www.google.com/search?q=human+brain+size+decreasing&oq=human+brain+size+decreasing ), despite the obvious trend over the last few million years. So, insert standard disclaimers about evolution-isn't-unidirectional, progress-isn't-the-only-story, and even measurements-of-change-are-dependent-on-the-scale-over-which-they-are-being-statistically-averaged, yadda yadda. 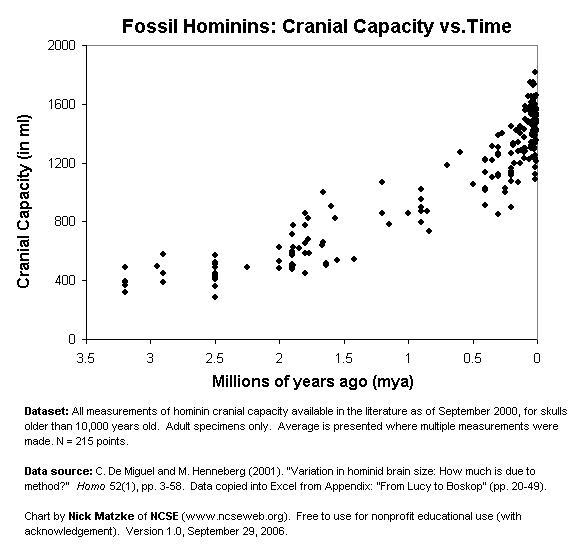 All that said, the cranial capacity dataset is still overwhelming and impressive evidence of gradual evolution of a major trait ("gradual", meaning small steps like Darwin meant, not constant-perfectly-smooth-rate-ism like various naive caricatures of the term "gradual" suggest). It is also evidence for transitional forms, although many hominins also come out as transitional in discrete-character cladistic analyses, as creationist Todd Wood found out to his chagrin, so you can't claim brain size is the only evidence of gradual transition and so can be ignored.